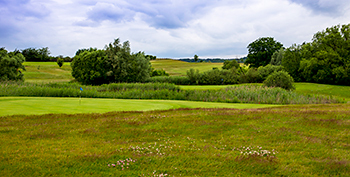 When the shipping business of Swede Sven Olav Brax diversified in the early 1990s with the acquisition of a sizeable 3,700-acre Polish farmstead, nobody at the time would have believed such a move could lead to the present day Bonowo Park golf complex. Located just outside the Baltic seaport of Szczecin in the north west of the country, the 27-hole golf facility – formerly part of the farm that still produces cereals and potatoes – started out with a short 9-hole executive course and driving range before the 18-hole course was added the following year. Binowo Park measures just over 6,500 yards from the back tees, with five par threes and five par fives on the scorecard. Water only comes into play on the front nine at the par four 9th hole but on the inward half, all but three of the holes (10, 12 and 16) have greens guarded by water hazards. Swedish sporting legend Sven “Tumba” Johansson – who represented his country at ice hockey, football and golf between 1952 and 1973 – officially opened the course in September 2000, with guest of honour Princess Birgitta of Sweden in attendance. Binowo Park is worth a visit if you are in and around Szczecin, opened at the start of the 2000's and definitely fun golf with plenty of strong holes. The style of this course is certainly recognisable as what you may call an early 90's style that opened in England around that time. The first hole is what it should be; a long hole (par-5), pretty straight, a little uphill and not that difficult - courses that start this way seem not to have any congestion issues, avoiding any frustrating. The very next hole is a favourite of mine; only 350 yards dog-legging right to a green with run-offs on all sides - the smart play is 200 yards straight and then 150 yards right but the risk/reward is there too. A 280 yard drive over the corner is on but be prepared to pay the consequences if you get it wrong. The 9th hole is the strongest par-4 on the front; SI-5 and around 430 yards long. An elevated tee helps to a fairway that continues downhill but the approach is the toughest shot - over a lake to a kidney shaped green with bunkers protecting at the back. The second nine holes can certainly be described as more dramatic, here every hole has water to negotiate at some point. The 13th and 14th holes are both par-5's and both give chances to score well with the 14th 90 degree dog-legging to the right but the downhill fairway can put a drive within reach of the green. Of the four Polish courses I have now played, Binowo has the best finish, the 17th is a par-3 just under 200 yards, over water and over sand to a semi-island green - it's not quite Sawgrass but you should get an idea of what the pros face at the Players Championship every May in Florida. The last hole is the choice of all 72 Polish holes I have played so far; a par-4 at 430 yards with water all the way down the left side which continues to protect the green at the front - the fairway slopes from the right towards the water putting a premium on the tee shot, which has to be pretty long to even consider trying to reach the green in two - smart play is a lay-up and trust your short game from around 70 yards, with a SI-2, most will have a shot to play with here. There is a very warm welcome at the club and the course has plenty of highlights, hope to play here again someday.